I am not stationed in a school building which makes it difficult to connect with other teachers outside of professional development sessions. Some days I really struggle to make an actual meaningful connection. I was reading about a method a sales person uses to grow their business. So I modified it to fit me and it has really made a difference. I used two simple cups and five paperclips. 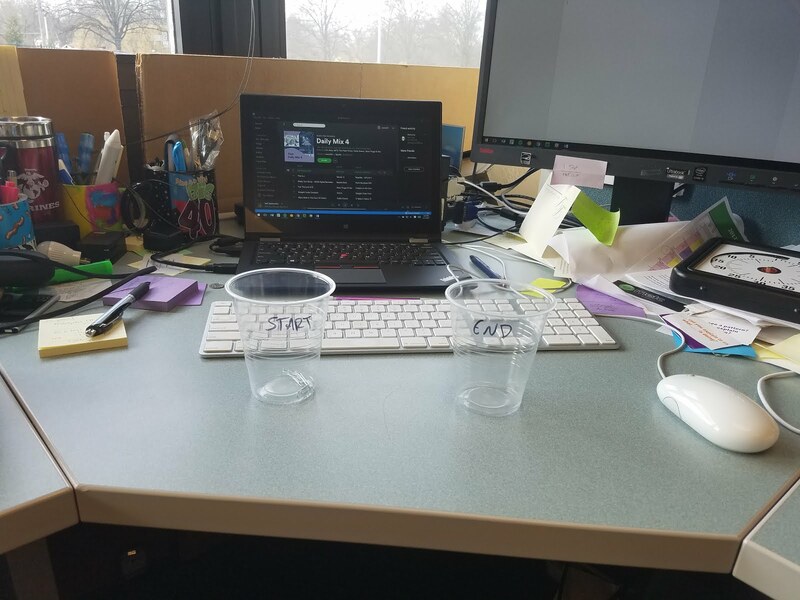 When I make a contact with a teacher I move a paperclip from the start of the day cup to the end of the day cup. My only rule is that the contact has to be face to face, electronic does not count. I already have plenty of virtual connections, I wanted to increase my human contacts. This physical cups are right by my coffee reminding me to get out and find people. I sometimes just go to a building and walk around. These walkabouts have made new connections that I would not have had otherwise. I think if I was back in the classroom I would do something similar but each paperclip (or stick) would have a student name on it. I would strive to make a contact with each student once a week. My goal would be to talk about things that were not classroom related. The best conversations I remember about my classroom were things that were not directly related to any standard or lesson. I’m positive that is what my kids also remember. Side note. I do get hassled about my messy desk. Below is a wide shot of what it looks like right now. Below, on and above my desk is full of stuff. There is that saying about a messy desk and a messy mind. Totally get that. 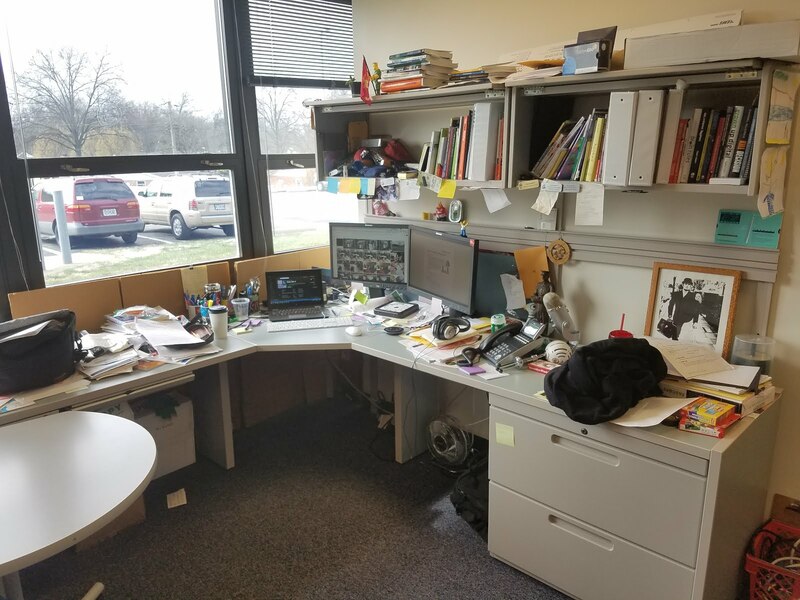 So what does that mean if you have an empty desk? Previous Post It is always the darkest before the light. Oh my goodness, I LOVE THIS! What a great, tangible idea on how to increase contact and conversation with both students AND teachers! I'm going to do this! Thanks so much for sharing this! And a side note to your side note: messy desks sometimes make for the most interesting minds! So much going on! 🙂 Thanks again! Funny. I just saw that quote today above a computer where I was a guest and using the room for a PD session. I love the idea of the paperclips. I will also say that I think one of the most important things teachers can do for kids is to talk to them and really listen. Not about the school stuff. About the real stuff. Thanks for the reminder. I love this! This is why I love using writer's notebooks in the classroom–you make that personal connection and gather information about kids that you never would have known. I wish I would have used the paper clip idea over the past six years! And, the messy desk looks perfectly organized to me! So much to love. My desk is messy and I work best that way. Love the paper cup idea. What a totally awesome idea! Very visual. I could see lots of ways to use this trick. Thank you! As a fellow messy desk person, I definitely don't buy the messy desk, messy mind thing. I prefer full. Busy. Active. Etc. I also really like this tangible idea for making contact and connections happen.